Is there a company, in recent years, that does more to polarize its stakeholders than Walmart does? We would be hard pressed to find an example. In this video, we discuss the retail giant’s win-lose strategy and how it affects their bottom line. We also show how companies can be successful and even have a purpose, while still forgetting all about company social responsibility. We can all agree that Walmart is hugely successful, at least in terms of money. It is the largest company in the world by revenue. With a store on every corner, brand recognition is almost at overkill levels. Walmart’s motto is “save less, live better,” and it does help customers do exactly that. Looked at from the customer side only, Walmart is exponentially successful and shows no signs of letting up. A great deal of that success comes from emotional marketing. TV commercials portray happy families coming together at the dinner table, ready for a delicious feast courtesy of Walmart’s amazingly low prices. Several years ago, when Walmart announced store closings in communities around the country, loyal customers were up in arms. Many said they felt betrayed and did not know what they would do without Walmart. If company social responsibility consisted only of impacting one’s community, Walmart would be king of everything. But as we said before, Walmart polarizes its stakeholders into factions. On one side, there are customers singing the praises of their favorite store. On the other side, employees and vendors complain of being squeezed out, getting the short end of the stick. They are the losers in this win-lose situation. Public employee protests are now commonplace. Walmart workers want better wages, more consistent hours, and a more robust work life balance. Vendors want more competitive rates for their wares. The backlash became so severe that, at one point, there were lawsuits against the company in 31 states. Walmart has already paid out hundreds of millions of dollars in civil suits. Walmart’s single minded devotion to pleasing and retaining customers has transformed the company into a global powerhouse. But what is the human cost of their business model? Will bad publicity and public outcry make Walmart change its ways? It is obvious that Walmart’s win-lose model is not sustainable in the long run. The worst part of Walmart’s culture is that other food retailers work hard to make sure all stakeholders win: customers, employees, vendors, and suppliers. Whole Foods is an example of this. If they can do it, why can’t Walmart? Walmart’s bad behavior shows that you can be a purpose driven company and still fall short in taking care of your company social responsibility. Their purpose of saving customers money keeps shoppers coming back, but devalues and mistreats the workers. We can’t help but wonder what the future holds, if such unsustainable practices continue to be standard procedure for Walmart. 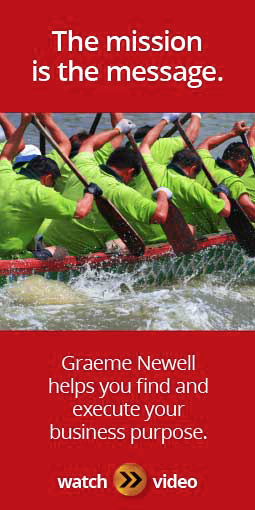 Check out Graeme's latest book called "Red Goldfish"